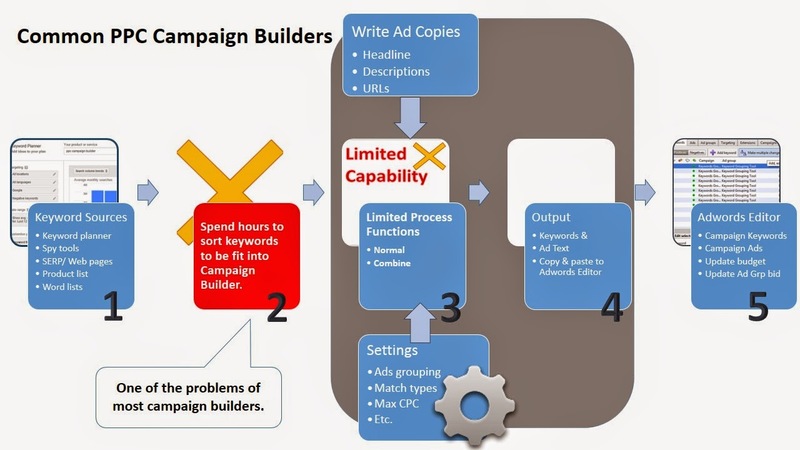 PPC Campaign Builder helps you to build Profitable PPC Campaigns Quickly and Easily. It is fast and is easy to use and it runs on your own desktop. 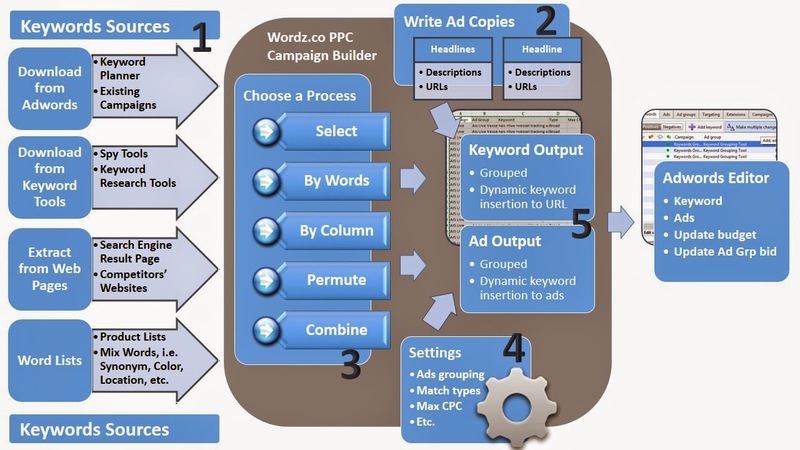 An overview of Wordz.co's PPC Campaign Builder & PPC Work Flow. Don’t sacrifice quality for speed! Because you can have both. You can generate such ad groups in hundreds in minutes. ALL our software do not contain malware, adware, spyware, harmful virus or any program that track usage or activity of the software. 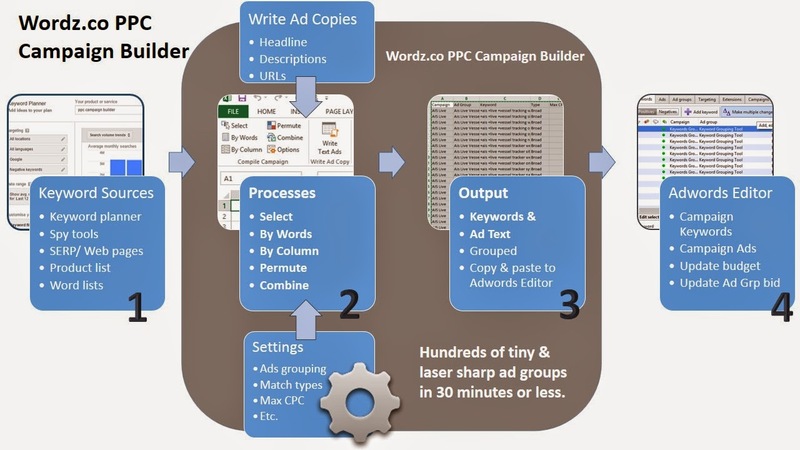 How is Wordz.co's PPC Campaign Builder faster than other builders? Unlike the normal campaign builder, you don’t need to sort or group your keywords (from various sources) first before feeding them into the campaign builder. Just highlight the Excel worksheet's cells that contain keywords, pick a function (out of 5 functions) to process and build your campaign. 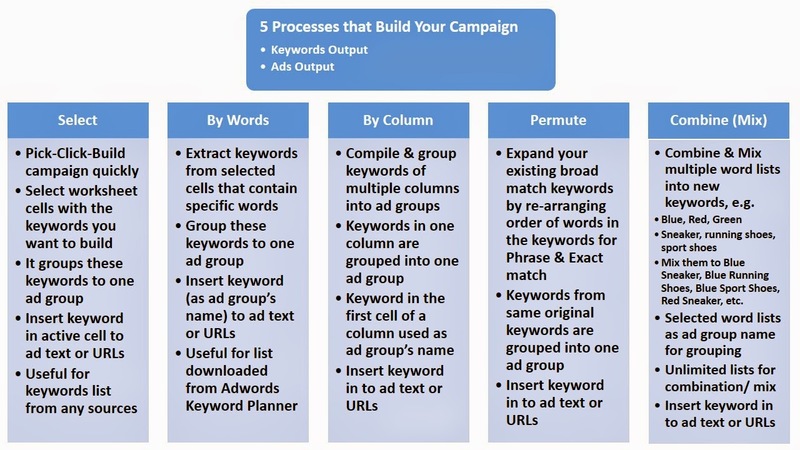 The OPTION to choose any of the 5 functions to process your keywords eliminates the need to sort your keywords manually to fit into a Campaign Builder. 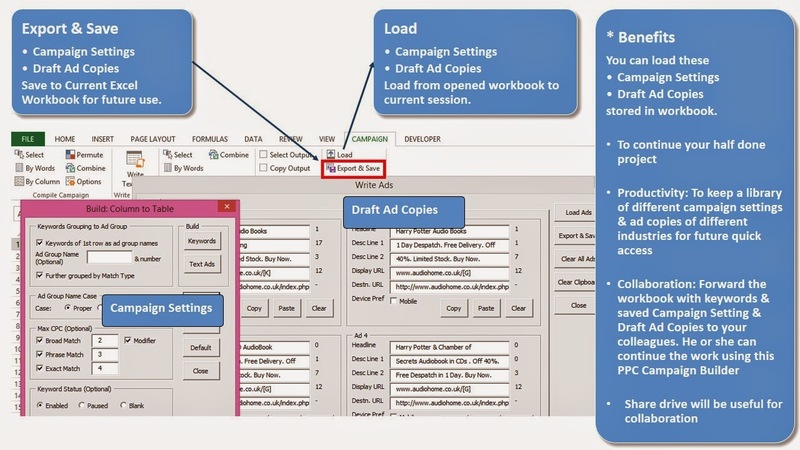 You keep all your campaign keywords and ad copies in Excel Workbook. PPC Campaign Builder provides the additional powerful commands to process these keywords and draft ad copies to output formats that allow you to copy and paste quickly to Adwords Editor. 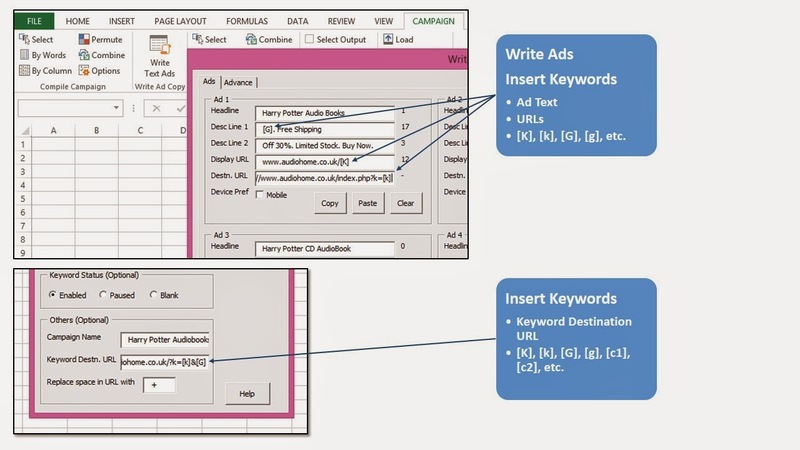 You can organize multiple campaign keywords and ads in multiple Excel workbooks. Download/ Extract keywords from various sources to your Excel worksheet. Group method, match types, max CPC, campaign & ad group names, URLs, etc. Copy & paste the outputs to Adwords Editor! What the 5 Processes Do? 5 Processes/ 5 Functions compile & group your keywords & ads to output for easy upload to Adwords Editor. Once you capture the keywords in the worksheet there will no "leakage" of omitted keywords. Using a spreadsheet like Excel to manage full list of keywords give you a sense of security that you can process ALL available keywords completely. No keywords in the Excel worksheet will go missing in the process. You know you have gone through and have made a decision on every keyword. It is NOT IN THE CLOUD. Only you know your campaigns, ads and keywords before they are published. No one else should know anyway. Keywords insertion to keyword destination URL, ad text, display URL and ad destination URL. The functions of "Load" and "Save" enable storing, transferring and retrieving of Campaign Settings and Draft Ad Copies. This enables sharing and collaboration of campaigns among your colleagues. Export & Save and Load functions are designed for collaboration among colleagues or PPC agents with their freelancers. Wordz.co's PPC Campiagn Builder is available now. The price is set at $167.00. To build our customer base we are giving discount for a limited period. It is now at $27.00. We dislike spam. ALL our software do not contain malware, adware, spyware, harmful virus or any program that track usage or activity of the software.